Boondocking is known by many names. You might hear dry camping, off the grid and dispersed camping to name a few. No matter what you call it, those who like boondocking have one thing in common: getting away from it all. If you’re in a travel trailer, this means you might be the only campers for miles. Seclusion in nature is the key aspect of boondocking. You may find space in an open place on public lands or in approved areas of National Forests and state parks. Or you might find a secluded spot in the midst of a beautiful area and just park. Some folks even find great spaces on private land. (Though, it’s a good idea to ask permission first; many landowners are more accommodating than you might think). 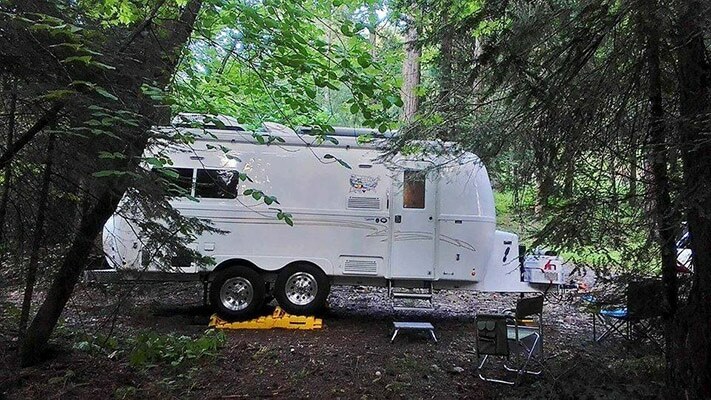 RV parking overnight at a primitive campground in the woods is as secluded as it gets, so when boondocking it’s likely you won’t have the amenities of a campsite like water and waste hookups, phone service, or electricity. But you make up for that with the benefits of seclusion, peace, and miles upon miles of nature. You don't have to worry about a nearby road, other camper's trash and waste, or other people's motorhomes and RVs ruining your views of nature. Oliver Travel Trailers are especially good for the boondocking lifestyle. Our trailers have large water tanks and waste holding tanks and with a bank of four batteries, LED interior lights and two optional 30lb propane tanks give you what you need. Our solar package, standard remote fresh water refill abilities, and ample storage keep you comfortable on your long adventures away from home. In addition, the insulation from our double hull fiberglass construction means you’ll have the same comfort in the Southwest US as you will in the wilds of Canada.